new shimano SM-MA-R180P/S brake mount adapter. fits rear IS (international standard) frames for 180mm rotor. Sram code r brakes. Front and rear. Brand new. All parts to complete install. Had different brakes that i wanted to use on a new bike build. 2019 Magura MT5 brakes, brand new! 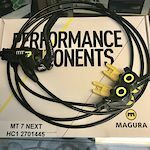 2019 Magura MT7 PRO brakes, brand new! SRAM 140mm Clean Sweep G3 Rotor 6 Bolt. Used for less than 6 months. Asking $20 OBO. Free Shipping to Continental US. Shimano 203mm SM-RT66-L Rotors AKA SLX. Have 2 that are the same. Asking $25 for 1 or $45 for the pair. Free Shipping to Continental US.